Editor’s Note: A recent research report sheds light on common challenges learning leaders face. These challenges were discovered through research and surveys conducted over the course of a decade. In this series of articles, we will explore these challenges and how learning leaders are responding. This article is the third of an eight-part series. There are many challenges facing learning and development (L&D) professionals today. According to a Training Industry, Inc. research report, about one-third of survey respondents identified content relevancy as a challenge within their organizations. But what does content relevancy mean, and what does facing that challenge look like? Some L&D professionals argue that among the challenges L&D leaders face daily, content relevancy is one that could potentially impact business objectives and employees in a positive way when driven by innovation. By striving to keep learning content relevant, you’re making sure that employees have the most up-to-date skills they need to do their jobs. When driven by innovation, making training content more relevant can benefit the organization, its employees and/or clients. But at the same time, solutions addressing content relevancy are likely to be temporary solutions. 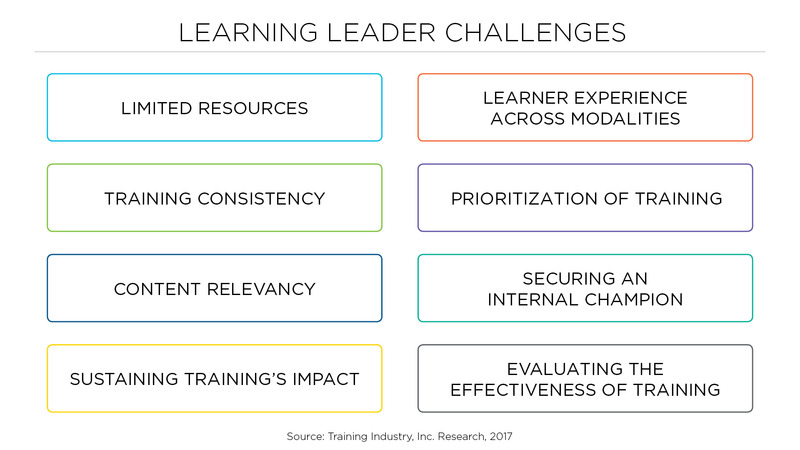 “The fundamental challenge remains the same today as it was nearly 30 years ago,” says Bob Szostak, program manager at Raytheon Professional Services – that is, the challenge of providing learners with effective learning experiences that drive and enhance both L&D and business objectives. However, as the workforce evolves, so, too, does the content employees need to learn to effectively do their jobs. It can be difficult to overcome this challenge, even temporarily. Tom Whelan, Ph.D., director of corporate research at Training Industry, Inc., suggests a two-pronged approach: “From the trainer side of the equation, address complacency in the L&D function or complacency with how training has been executed to date. From the learner side of the equation, you must keep in mind learner motivation.” In other words, there needs to be a balance between learner preferences and what training professionals are able to provide — or what they’re willing to support based on what they see as cost-effective. There needs to be a balance between learner preferences and what training professionals are able to provide. Barbara Jordan, the group vice president of L&D at Sims Metal Management, says that the information provided in training has to be “relevant, engaging and something that [learners] believe.” It’s critical to find out how to get it right; otherwise, learners won’t come back. Consider the importance of creating content that’s relevant for a global organization with employees in different countries with relatively the same job responsibilities, but not the same job titles. “You really have to know the functions that the various roles perform in order to create a curriculum,” says Jordan. Otherwise, you risk creating content that doesn’t resonate with the intended audience and thus doesn’t develop employees properly. Content learners can’t relate to can severely impact the effectiveness of an otherwise excellent training program. Additionally, if the learners cannot transfer knowledge on the job after training, you run the risk of wasting training resources. A key asset to providing learning content for a national or global audience is the advancing technologies and training delivery methods that have emerged over the years. Today, learners want, and often need, to access information at their specific place and time of need. “[Sometimes] you have to meet them where they want to learn,” says Jordan. For example, not everyone finds instructor-led training to be the most convenient option anymore. Most learners want training content that’s accessible on a mobile device or laptop, thus making it possible for them to complete at their convenience. Similarly, Whelan says you must take into account the purpose of the training: “The training shouldn’t just be bright, shiny and cool. It should be what employees actually need to do their job in their current environment,” he explains. Jordan agrees, saying that everything must be aligned, and “you shouldn’t train for training’s sake.” The training must be relevant both to the learner’s job role and to business objectives. If the learners’ wants do not align with the needs of the organization, then the organization’s needs take precedence. In order to ensure training alignment, Jordan says you must “work strategically to understand key objectives and the company as a whole to make sure you’re aligned to those goals and strategic plans.” This process can include refreshing content around the business goals and plans or purchasing new content when necessary. When business goals or business challenges shift, evaluate your training programs to see if they should also change. If you look to the market for support in developing your programs, Szostak says that no one knows what a business needs more than its people. When evaluating vendors, it’s important to find one that seeks “to understand the client’s culture, requirements and success factors” without ever claiming to know what’s best or what’s needed for your business. It is the vendor’s responsibility to ensure that you – the client – are being matched with the proper solution. So, how do you know what solution is appropriate for your training program? “Without the data up front, it is very difficult to have confidence in the solution,” says Szostak. Evaluating the effectiveness of training and collecting data is essential when determining what should change. For example, needs assessments can help determine the knowledge, skills and abilities of learners and whether those needs are being met by the training offered, says Whelan. “The analysis is an investment in the effectiveness and efficiency of the solution,” adds Szostak. In addition to determining the needs of the learners and the organization, stay on top of the current and trending solutions and technologies. It’s easy to get caught up in what’s shiny and new, so be sure to do your research to determine if it’s the right solution. Jordan says that understanding the value of a new trend or learning technology can help in determining how to incorporate it in a realistic way that meets your needs. But keep in mind that “while there is a lot of pressure to adapt, adopt and be on the leading edge of innovative learning practices, it is more important to be effective, efficient and sustainable,” says Szostak. It’s easy to get caught up in what’s shiny and new, so be sure to do your research to determine if it’s the right solution. While the challenge of providing learners with efficient and relevant learning experiences that drive business objectives remains over the years, the elements around it do not. Learning and development and the workforce are changing daily, which means that the relevancy of learning content is continuously in need of an update. The keys to keeping content relevant are strategic alignment and having the right learning solution. Sometimes, both of these elements need to be updated to ensure they’re the right fit.